Apple has come up with a way it thinks could provide headphone and earphone users the optimal listening experience, using a variety of signal processing techniques to make the sound seem like it is being heard without the use of headphones at all. Granted by the U.S. Patent and Trademark Office on Tuesday and initially filed on September 22, 2016, the patent for "Spatial headphone transparency" describes ways a pair of headphones could adjust the sound from an audio source, changing the way the user hears it. Apple uses the term "acoustic transparency," which it also refers to as transparent hearing or a "hear through mode," where a headset picks up ambient sound from the local environment of the wearer then, after processing, includes it in the audio feed that is played to the wearer. If performed correctly, this could make the user's listening experience "as if the headset was not being worn." 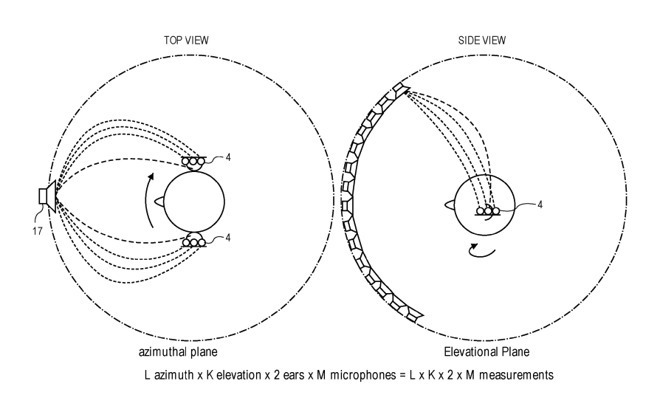 In one section, the patent suggests the use of microphones to pick up sounds that the user would have heard if they were not wearing headphones, then for the left and right sides separately processing them through an acoustic transparency filter, before being combined with the audio the user is listening to. The composite audio is then played through the left and right speaker drivers. The filter in question will attempt to preserve any spatial filtering effects that would occur naturally, such as how the user's head, shoulder, and other anatomical features can affect the timbre and other acoustic elements of the ambient sound. The filter will also attempt to avoid coloring the speaker driver signal, such as reducing resonances at higher frequencies, to accentuate the effect. 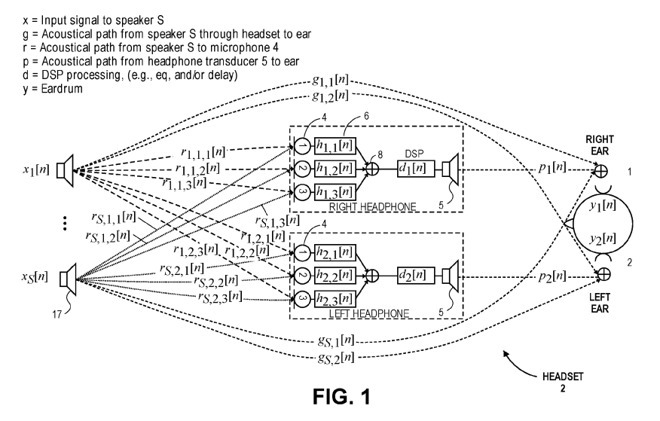 In some embodiments, Apple also attempts to use the system to eliminate the effect of headphone-based music being heard "within the user's head," instead making it sound as if it's stemming from speakers positioned directly above the user. This is thought to help reduce any acoustic occlusion with ambient sounds, namely making it easier for the user to identify nearby noises without it clashing with the audio track. Apple does have experience with audio processing that could potentially make such a system a reality. The adaptive audio function of the HomePod is capable of detecting the environment and optimizing its output to fill a room with sound, regardless of nearby obstacles. 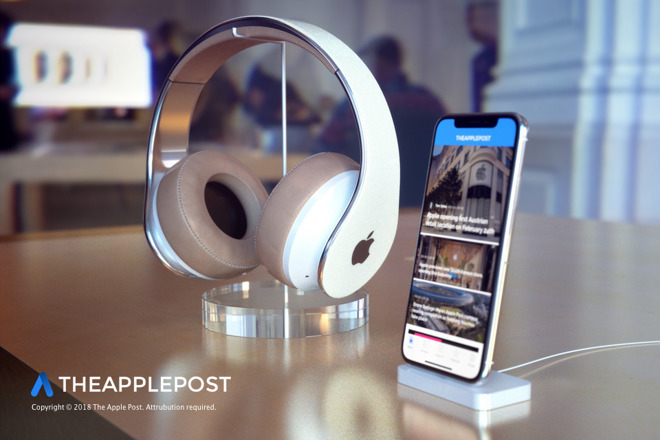 Apple is also rumored to be working on a new headphone project separate from the Beats line, one that could provide noise-cancellation abilities. Thought to be a premium audio peripheral, the headphones are currently speculated to arrive no earlier than the holiday shopping period at the end of 2018.